In the utmost northern part of the province of Overijssel, the pittoresque village of Giethoorn is situated at such a limited distance from the conurbation of western Holland, that h can be covered in nearly one hour driving by car. Giethoorn is a rather unusual village, caused by the fact that it happens to have an awful lot of one thing, being .... WATER!. In this remarkable little village you'll find a lot of canals and many chracteristic small bridges, wooden platforms and farms. All this as well as the fact that it's situated in the National Park Weerribben -Wierden, is making Giethoorn very popular among the many visiting tourists. 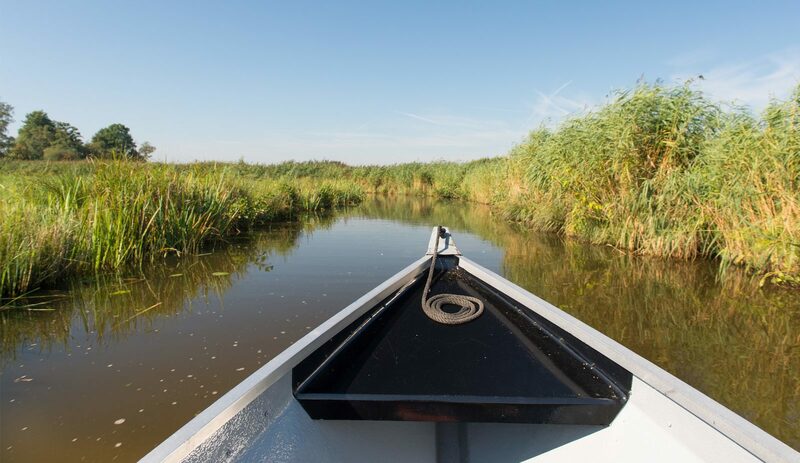 Nature-, culture- and watersport lovers, both young as well as old, can enjoy themselves tremendously well in Giethoorn. No matter which season you choose, Giethoorn is (and always will be) the one and only ideal holiday destination. According to the tradition some 750 years ago Giethoorn has been arised out of (from) the establishment of a group of flagelants (self-flogging people) in the at that time (then) waste (desolate) territory. Giethoorn developed into a little village, where the inhabitants lived on the proceeds of peat extraction , combined with keeping livestock, reed cutting and fishing. Caused by the peat extraction emerged a landscape with small warterholes (called the bogholes or weres) and little pieces of land (the so-called legakkers or ribs). Caused by major floods eventually a landscape of weedings emerged around Giethoorn . Nowadays the local entrpreneurs are mainly living on the outcome (proceeds) of recreation. Each year some one million tourists from all over the world are coming (partly back) to the pittoresque village of Giethoorn. Everything that's being able to float is to be found here on a beautiful day. The local Tourist Information Office is located in the "Kulturhus". Of course Giethoorn is well-known for it's village-canals and it's footpaths along these canals. It's a wonderful experience to sail through these canals with a "punter"-boat or a "whisper"-boat. The National Park Weeeeibben -Wieden is situated in the utmost northern part of the Province of Overijssel. It's a landscape in which water and reeds are dominating. This National Park is shaping (making up) the most important swamp area of north- western Europe. The current landscape of Weerribben-Wieden has been originated through leveling the peat for the benefit of the peat extraction. Tracks of this development can still be (are still to be) found back In the landscape as well as in the name of the territory. Ridges are narrow strips of land (ground) on which the protruded peat was laid down to dry and the weres are the outpeated parts of the peat, which are also being called peatholes. After the peating period, the cultivation of reed (cane) became determinable for the countenance of the landscape. Although the possibilities to hike and bike in a water-rich area like The Wieden are more limited than to sail, these possibilities nevertheless are still very attractive . Furthermore also accompanied excursions are being organized, such as combined sailing- and biking-excursions , excursions to the ducks cage as well as to the birds-observation hut. There are also extensive biking tours to be made on the bicycle tracks , which are mostly located around the park area.